Rockstar Energy Racing headed to Indiana for round 11 of the pro motocross series and the first ever stop at Ironman Raceway. The general consensus around the pits was the track was great as well as the facility itself and general aesthetic appearance. Some could even be heard saying that it might be their favorite national track. Then mother nature stepped in. Early saturday morning the heavens opened up, unleashing a torrential downpour that would last into practice and create a complete quagmire. Bikes were getting stuck in mud so deep that they could not be pulled from the depths without the aid of equipment. The team handled the extreme conditions with exemplary breakout out performances in both classes. Joey Savatgy has really been finding his speed as of late with top 10 finishes in six consecutive motos coming in to Indiana. Coupling his speed and consistency with good starts, he set his sights on a higher goal of getting into the top 5. After a very water soaked first practice where Joey barely got any time on the track, his second time out was a complete debacle. Before he even got a lap in, he found himself amongst a crowd of bikes that we're completely sunk. Savatgy was unable to record a time at all. The worst part is the track was much faster in the latter practice. If that wasn't bad enough, with almost no track time, he was quite unsure of the layout of the circuit at all. In moto one Joey rocketed out of the gate with what appeared to be a sure holeshot. Then the very unpredictable start straight slowed his momentum as his line got deeper and deeper. He was still able to get a decent start and rode what was then the best moto of his career. That was until moto 2. The young rider started very near the front and had some heat behind him. At about the halfway point he moved into the lead and held it almost until the 2 lap card came out when he succumbed to Marvin Musquin. Had Savatgy been able to hold him off, it would have meant an overall victory. However; 2nd place is nothing to be upset about and can definitely be considered and extraordinary performance. Joey Savatgy: "It was really cool! Both motos I had good starts. The first moto I should have had the holeshot but I just got caught up in some mud and got squeaked out. Overall it was good. Both motos were solid. I went out for first practice and had one fast lap and two laps total but I qualified 8th. I went out for second practice and didn't do any laps cause I got stuck and ended up qualifying 17th overall. Racing was good though. I knew with the mud, starts were going to be really important. I've been working on the mental side of things knowing that I need to believe in myself again in order to get back up on the box like I did today. I need to know that I can run with those guys. 4-3 on the day for 2nd overall. I will take that." Jason Anderson's practice went much better than Savatgy's as he was able to actually complete several laps and earn a much higher qualifying position. He was also able to put two good starts together and by the end of moto 1, he finished just behind his teammate for a solid 5th place position. The second moto started even better but quickly went downhill as he was railing an outside line in a berm and his front wheel simply plunged into the muck bringing him to a complete stop. The incident happened so early in the race that he was passed by the majority of the field. 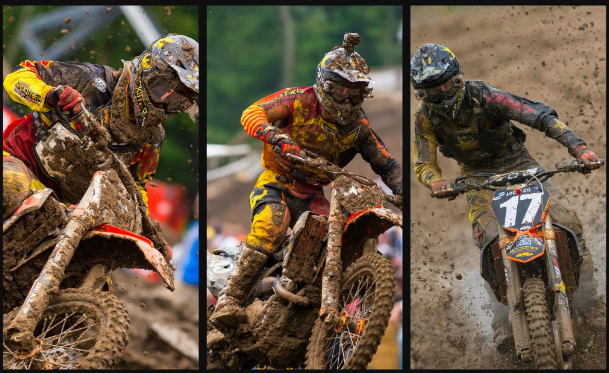 Anderson was then not only forced to deal with the mud, but also the erratic riding of the others in front of him also negotiating the slick surface. In an attempt to move forward, Jason went down several times. After all was said and done though, somehow he miraculously still finished inside the top 10. Jason Anderson: "Today was really tough. I had a lot of fun riding in the mud but things just didn't go my way. My starts were pretty good in both motos but I just made mistakes. In the second moto I was near the lead and then got my front tire stuck in a mud hole. I made a few more errors as the race progressed but still managed to get 10th in that moto. Next weekend is my last ever race on a 250 so I want to go out on a really positive note." Much like Joey, Ryan Sipes had a career day. He has been contending the GNCC series for much of the year and has seen his fare share of mud, ruts and adverse conditions in the process. Everyone knew that he was one of the most prepared riders on the track when it comes to riding in an outright mess. He did not disappoint the local fans as Ryan hails from nearby Flaherty, KY, just a short 3 and half hour drive away. In the first moto, he was running in an impressive 4th place when the thick, sticky mud clogged his goggles and he couldn't see. He tried to wipe them off with his hand and went down in the next corner in the process. He strived to pick his bike up and it took a considerable amount of time. To make matters worse he was also forced to enter the mechanics area for another set goggles. He was able to make his way all the way back to 10th by race's end. By this result, it was clear that Sipes had potential to run near the front in moto 2. As the pack exited the first turn, he once again successfully put himself in a good position. He executed the tough terrain for the entire 30 minutes plus two laps to an incredible 3rd place finish. With the way the math worked out, his two results were good enough to garner him 4th overall just one spot off the podium. Ryan Sipes: "It was a good weekend. The track was a muddy mess but I had fun! The first moto I went down and had to get backup goggles but I still felt that I rode good and I knew that I could be up there if I got another good start. I did that and made some passes at the beginning. I took one big digger out there but I was still able to pull off a 3rd. 10-3 for 4th overall, I'm not mad at that." With only one round remaining in the 2014 season, the squad will head to Tooele, Utah, just a short distance outside of Salt Lake City. Savatgy will come in with a new found confidence and try to repeat his stellar achievement. Anderson will be finishing out his 250 class career before moving up to the premiere 450 class and will be looking for a win. Sipes will shoot for another top 5 and then will be heading back to the woods to contest the four remaining rounds of the GNCC series.